In modern society, when you think about healing or even growing spiritually, you probably get a visual of an inward and solitary journey. Perhaps there are people or beings who share certain aspects of the process with you, but only one soul walks the path of healing from the beginning to end. And yet, we can look at any international crisis, like a natural disaster, and see how the global community, fueled by compassion, comes together to support one another. Or when tragedy or triumph strikes in local communities, people quickly band together and work alongside one another to provide tangible and intangible resources. And when personal loss, sorrow or joy an individual, these types of momentous life events like birth, death marriage and illness have a way of getting people to drop what they're doing and through community unite to support, nurture, comfort, or celebrate one another. There is a wonderful fable of Aesop’s where a man calls his sons together just before his death to say goodbye and pass on his wisdom. He hands his oldest son a bundle of sticks and tells him to break it. The son tries but can’t do it. The two younger sons also try, but are unsuccessful. The man then says, “Untie the bundle and each of you take a stick.” They do as he asks and the man says, “Now try to break the sticks.” Each son easily broke the stick in their hands. In community we are strong. And community is much more available to you when you allow yourself to truly understand this. The choice is ours: to be the lone stick on a lonely journey, or to be a part of the bundle, stronger and wiser together. To experience the power and love of a community wrapping its arms around you, or to be a part of the wrapping yourself, is one of this life’s precious blessings. But in our high tech and low to touch modern world, it can be difficult to find a sense of spiritual community, especially in some locations. There are however alternatives, and ways of connecting with others through community by leveraging the technology, and social networks we have collectively created. Rather than pointing fingers and judging technology for ruining the strong forces of community in our world (as I recently overheard a woman in a crystal shop doing) we can choose to embrace the changes and connect with one another to create positive shifts now to positively impact the future. The truth is, that whether online or offline, community can function as a bridge between your inner self and the greater world. Without this bridge, you cannot share your gifts and talents with the world. You cannot easily engage in the beautiful cycle of learning and teaching, and in the simple truth that we're often inspired to share and teach what we ourselves most need to hear and learn. In addition, having a sense of community can sustain and and motivate you when things are going well in your life, and can offer strength, comfort and guidance during challenges. Although you may sometimes feel like it, you never really stand alone. There is truth to the idea that communities used to be stronger, playing a much more obvious role in society. Survival depended on large groups of people working together, sharing, and carrying a portion of the burden for all. Roots where perhaps a little deeper and the sense of connection to people, place, and past was stronger. Today, the need isn’t really less, it’s simply shifted. In this way, community is also a bridge between past, present, and future. When you are on a healing or spiritual journey, it’s vital to reach out to cultivate community, whose purpose is to provide you with nourishment, connection, wisdom, and understanding during this time. Marking the journey with small or large rituals is also a fundamental part of sharing community and growing through shared experiences. Here are some of the benefits in doing so. Motivation – It’s easy to despair when things get tough; especially when we feel isolated or misunderstood. With like-minded and caring people surrounding you, there’s a natural motivating energy that continues to build, allowing you to carry on. Community can even help you transform despair into hope and an abundance mentality with just a few kind words, a simple shift in perspective and connecting with another real person who also has been through struggle, and can now offer guidance and kindness to help you make it through. Collective Consciousness – Brainstorming is best as a group process because the mental energy that’s generated has a natural tendency to build as people bounce ideas off each other. It’s simply not possible for you to have all the answers, never falter or doubt, and always know what’s best. In community, you can share your wisdom and receive it from others, growing ideas together. In many ways, this is the ultimate functioning of any community. Accountability – When others are depending on you, there is a greater sense of honor and respect that goes into your work or tasks. You aren’t doing something just for yourself, but for the benefit of others. Your role in the community enhances the lives of others and vice versa. It’s a beautiful energy to be accountable to mutually supporting others. Deeper Belief – In the midst of crisis, faith can falter and it’s impossible to have hope or belief in anything good. In community, it’s not necessary to try to reach this impractical ideal of never questioning faith. When you can’t, your community will take up the mantle for you and carry you along until such time as you can again. And often, when you are the one doing the carrying for another, your belief is made deeper by the type of support you are giving. The modern worldview is one of individualism and achieving success on your own. Many define success by how much they accomplish alone. It isn’t always easy to shift from this mindset. But once you embrace the healing power and beauty within community, you will see how much more stronger, grounded, and connected you feel. Communities are like ripples in a pond – they start small, with those closest to you, and extend out ever larger to all of humanity. Another wonderful way of creating, and building community is when individuals come together around a common idea, topic or interest to share, learn, grow and connect with each other. This is exactly the inspiration for The Angel Solution Community and Membership Program. 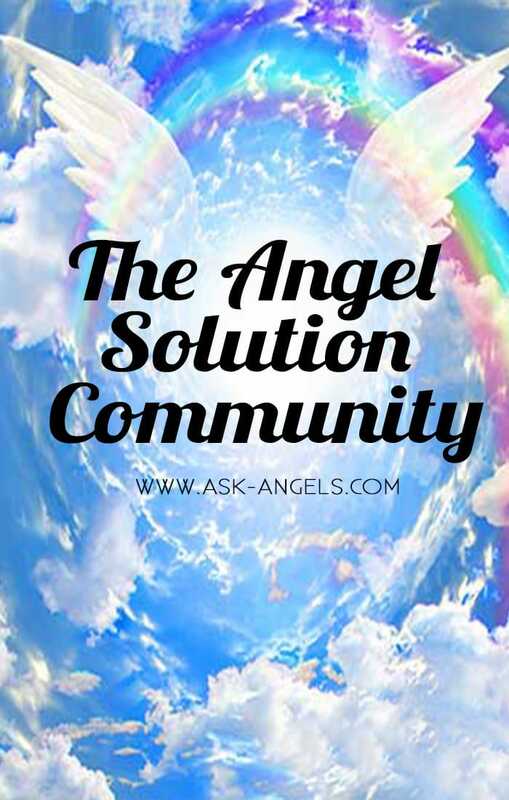 This program not only the opportunity to become more closely connected with your angels and teachers in spirit, but it also has a strong community component where you can connect with other inspiring, compassionate and loving spiritual seekers who are just like you. By connecting with one another, even through online platforms we can together can access the many blessings and benefits of spiritual community. I look forward to connecting with you there! Are Soul Mate Relationships the Same as Karmic Relationships?